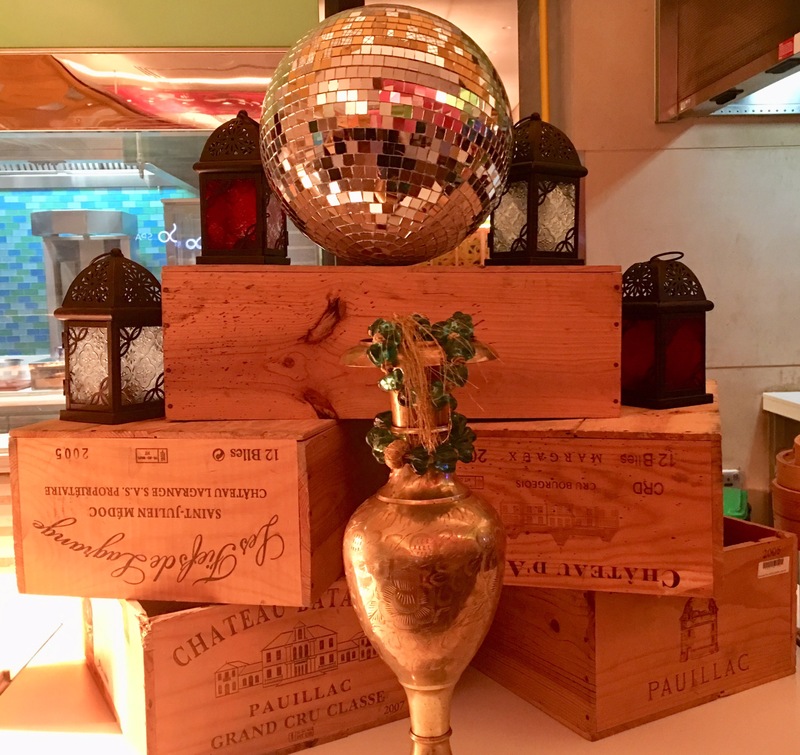 Last Thursday, The Disco Night at Les Cuisines restaurant made a comeback and I visited the restaurant to check it out. The Disco Night is a Disco themed night that happens at Les Cuisines on every Thursday. Les Cuisines is an all-day-dining restaurant located in the Level 2 of Sofitel Dubai Downtown. You can expect buffet for breakfast, lunch and dinner. Their buffet offer French cuisine to Asian specialties and Arabic dishes with a twist. I was invited for their relaunch of their Disco theme night on September 28th. When my guest and I reached there, it was total chaos as they couldn’t seat all their guests. We had to wait for 20 minuets to get our table. The lady at the reservation desk was rude and the staff were not helpful either. Thankfully, once we were seated things moved smoothly. If you are thinking of having a noisy and music-filled Thursday evening, The Disco Night at Les Cuisine is the place for you. Les Cuisines is a casual dining restaurant with modern and basic decor. But on Thursday evenings from 7pm-11pm it transforms into a Discoland. Listen up! The disco night is back, bigger and better than ever and is the perfect way to kick-start your weekend. Enjoy a complimentary range of irresistible tapas-style bites bursting with flavor, dance away to 70’s & 80’s disco classics and choose from incredible beverage packages. Join in and relish in the disco fever, with Danny Aridi Performing live and all your favorite songs. The atmosphere was fun and lively with fabulous music from the 70’s and 80’s. The beverage package starts at an affordable price of AED 119 per person. You can order your drinks from their beverage menu and the drinks are served to your table. And for food they had a decent selection of tapas-style bites which we picked up from their buffet. The bread and cheese selection. Salad counter with a variety of Mediterranean style salads. From the cold mezze selection, we especially liked their Muhammara. We also liked the tempura, cheese rolls and bruschetta in their appetizer selection. Apart from grills, there were live cooking station for pizza and pasta. 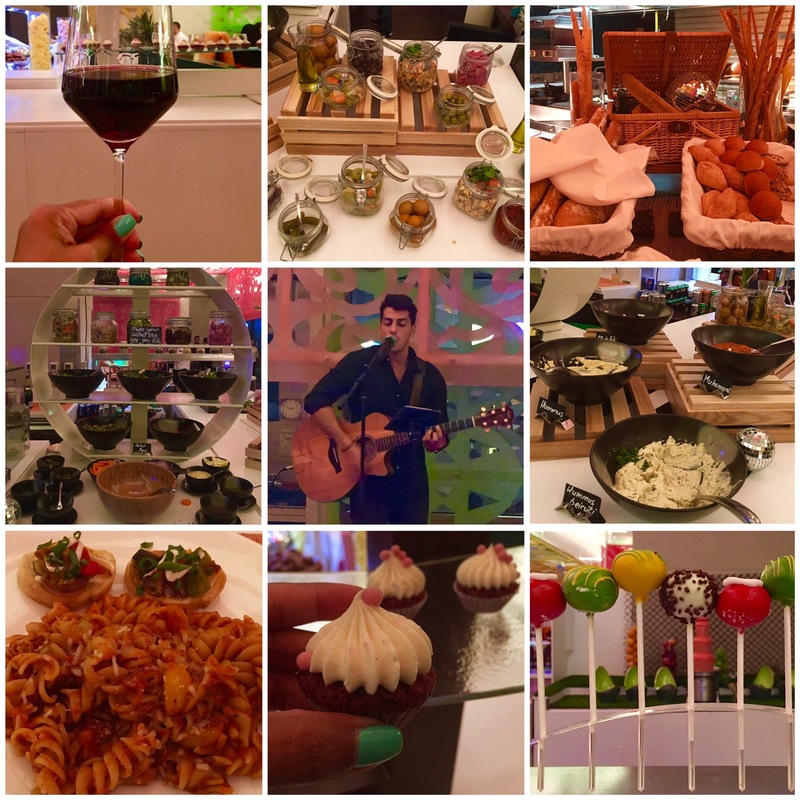 In the dessert station there were cakes, puddings, pastries, candy floss, cake pops, chocolate fountain and fruits. Overall, it was good. If you are looking for a peppy Thursday evening that does not make a dent in your wallet, then you can book a table at Les Cuisines for their Disco Night.